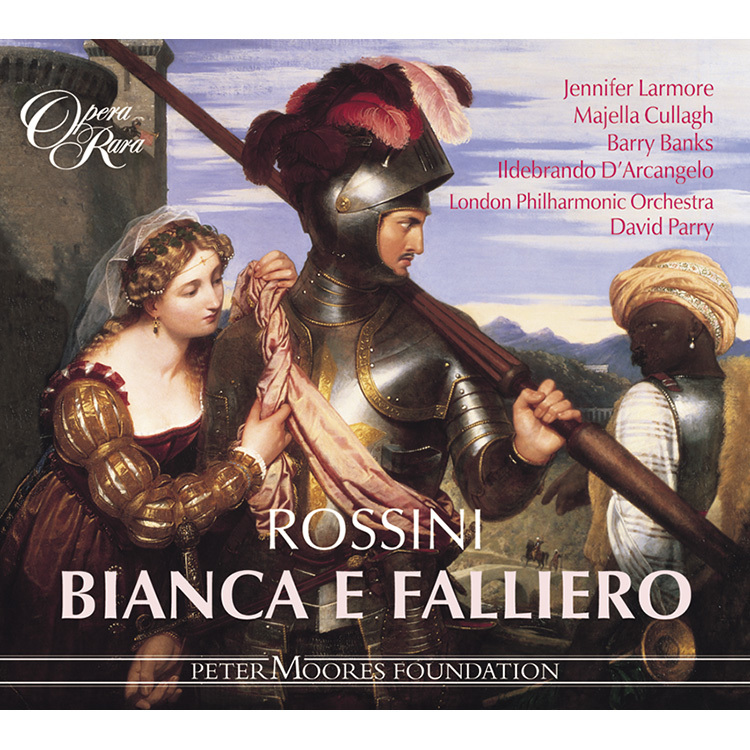 This opera, which is one of Rossini’s most sumptuous and ornate, tells of Bianca’s love (Majella Cullagh) for Falliero (Jennifer Larmore) and her struggle to resist her father’s attempts to marry her to Capellio (Ildebrando D’Arcangelo). 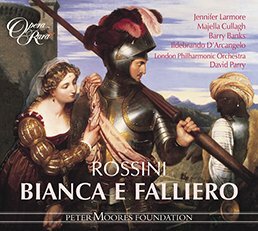 This opera, which is one of Rossini’s most sumptuous and ornate, tells of Bianca’s love (Majella Cullagh) for Falliero (Jennifer Larmore) and Bianca’s struggle to resist her father’s attempts to marry her to Capellio (Ildebrando D’Arcangelo). 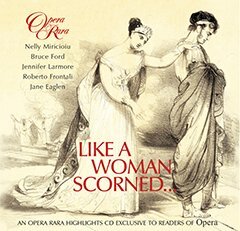 Jennifer Larmore the internationally acclaimed mezzo-soprano sings with Opera Rara for the first time. The difficult part holds no terrors for Miss Larmore who possesses one of the most agile voices before the public today. Majella Cullagh takes no vocal prisoners, sailing fearlessly through page after page of difficult music with the greatest of ease. This is a first collaboration between Opera Rara and the London Philharmonic Orchestra. 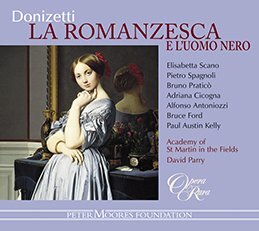 With an excellent compliment of supporting artists, this fascinating addition to Opera Rara’s Rossini list is conducted by David Parry. 04 Bianca e Falliero: Act I scena II: Introduction: Esce il Doge ? 12 Bianca e Falliero: Act I scena VI: Cavatina: Come sereno e il di! 20 Bianca e Falliero: Act I scena IX: Recitative: Mai con maggior coraggio in queste soglie – scena X: Oh! Ciel! Falliero! 21 Bianca e Falliero: Act I scena X: scena and Duet: Divisi noi! 27 Bianca e Falliero: Act I scena XII: Finale: Si, congiunti, omai son pieni – scena XIII: Padre ? Signor ? 33 Bianca e Falliero: Act II scena II: Recitative and Duet: Dell’onor tuo! crudele! 38 Bianca e Falliero: Act II scena V: scena and Duet: Non proferir tal nome – scena VI: Pisani! 39 Bianca e Falliero: Act II scena VI: scena and Duet: Cadde il fellone ? oh giubilo! 50 Bianca e Falliero: Act II scena XI: scena and Quartet: Donna chi sei? 53 Bianca e Falliero: Act II scena XI: scena and Quartet: Grazie o Cielo! 54 Bianca e Falliero: Act II scena XII: Recitative: Innoltra il di ? lassa! 56 Bianca e Falliero: Act II scena XIII: Recitative: Perdona, o mia Costanza – Final scena: Bianca! 58 Bianca e Falliero: Act II scena XIII: Finale: Oh padre! St Mark’s Square, Venice. The arcades known as the procuratie are crowded. Venetian noblemen and their ladies walk about in the square, rejoicing that a Spanish conspiracy against Venice has been foiled. Contareno and Capellio, two Venetian Senators whose families have for many years been engaged in a dispute over an inheritance, meet and hope for a reconciliation. The wealthy Capellio declares that he loves Contareno’s daughter Bianca, and that he will surrender all claims on the inheritance in question if he is allowed to marry her. Capellio immediately agrees, for he sees this as a way of restoring the former wealth and splendor of his family. The boom of a cannon heralds the arrival of the Doge and his courtiers, and the Doge tells Contareno that his opinion has prevailed and that the Senate has passed a law punishing by death anyone found guilty of associating with foreign legations. Capellio says that, had he been present at the assembly of the Senate, he would not have voted for so severe a law, since there is no longer any danger from foreign conspiracy. The Doge replies that Venice is not completely safe, for there is still a threat from Spain, and indeed it has been rumored that the noble Falliero has been killed in battle. An official arrives to inform the Doge that Falliero has, in fact, won the battle and is at that moment landing on the nearby shore. Falliero enters with his officers and is greeted joyously by the crowd. He announces that the Spanish army has been defeated, and he is praised by the Doge who invites him to join in a service of thanksgiving in the cathedral. The forecourt of Contareno’s house. Bianca and her handmaidens rejoice in the safe return of Falliero, whom Bianca loves. Her nurse Costanza tells her that Falliero intends to ask for her hand in marriage, but Bianca fears that her father will reject Falliero since he is not wealthy. When Costanza has left, Contareno enters and tells his daughter that he has chosen a wonderful husband for her. She hopes that he is referring to Falliero, and is dismayed to learn it is Capellio. Contareno warns her that if she ever utters the name of Falliero again, she will forfeit her father’s love and he will ensure that Falliero suffers as well. When Contareno also claims that he would die of grief were she to disobey him, Bianca unhappily submits to his will. A room in Contareno’s house. Falliero tells Costanza that he now believes he can visit Bianca openly, and not be viewed by her father as inferior. After assuring Falliero that Bianca is longing to greet him, Costanza sees her approaching, and leaves the young couple together. A distressed Bianca tells Falliero that her father refuses to allow them to marry, and has forbidden her even to think of him. She rushes away, and Costanza returns in great haste to warn Falliero that he is in danger if he stays. Constanza leaves, dragging Falliero away with her, and relatives of Contareno and Capellio enter with friends and servants. Finally, Contareno and Capellio arrive and, after them, Bianca, whose obvious unhappiness Capellio does not fail to notice, When Contareno orders her to sign the marriage contract, Bianca exclaims that she cannot, but her stern father insists, and she is about to sign when Falliero bursts into the room and accuses her of being unfaithful to him. Capellio and Falliero argue, Capellio insisting that Bianca is now his bride. Contareno orders his servants to throw Falliero out of the house, and a defiant Falliero warns Contareno and Capellio that his anger has reached fever pitch. A courtyard within Contareno’s house, divided from the residence of the Spanish Ambassador by a rear wall. It is night. Costanza leads a frightened and trembling Bianca into the courtyard, and persuades her to meet Falliero for a last farewell. Bianca agrees, but reluctantly, as she fears for Falliero’s life if he were to be found in the house. Costanza leaves, and shortly afterwards Falliero enters in an agitated state. He begs Bianca to elope with him, but she tells him that, although she loves him dearly, her honor would not allow her to disobey her father. However, when Falliero declares that his life depends upon her answer, she hastens to agree to flee with him. As they are about to leave, Costanza returns to warn them that Contareno is approaching. Falliero’s only way of escape is to climb over the wall into the Spanish Ambassador’s residence. Although he realizes that, were he to be discovered there, it would result in his death, he has no option but to climb the wall. He does so, just before Contareno arrives followed by Capellio. Contareno assures Capellio that Bianca loves him, but her obvious distress makes Capellio suspicious, and he is about to leave angrily while Contareno is threatening to disown Bianca, when Pisani, the Chancellor of the Council of Three, arrives with the news that Falliero has been caught within the Spanish Ambassador’s residence, and is about to be put on trial by the Council of Three. Contareno gleefully anticipates getting his revenge on Falliero. The black-draped Meeting-hall of the Council of Three. Falliero is brought in under guard. He asks who his judges are to be, and is told they are Loredano, Capellio and Contareno. He fears his case is hopeless, but Pisani tells him that, although Contareno may be harsh and inflexible, Capellio is a fair man, and will surely wish to influence Contareno now that he is married to Bianca. On hearing this, Falliero loses all hope. When he is brought before his judges, he refuses to defend himself and agrees to sign an admission of his guilt. Before he can do so, an attendant announces that an accomplice of the guilty man craves audience, and Bianca enters, heavily veiled. When her identity is revealed, Contareno attempts to have her removed, but Capellio insists that she be heard. Bianca explains how Falliero came to be in the Spanish Ambassador’s residence, and Falliero, now assured of Bianca’s love, declares his innocence. Contareno still wishes to find him guilty, and signs the death warrant. Loredano does so as well, but Capellio pushes the warrant away, exclaiming that Falliero will have to be judged by the Senate. A room in Contareno’s house. Capellio brings Bianca home. Telling Costanza that he must hasten to the Senate to speak on Falliero’s behalf, he rushes off to do so. Bianca remains anxious until Falliero himself arrives, together with Capellio and the Venetian nobles, and Falliero is able to tell her that he has been found innocent by the Senate. Contareno now arrives and tries to make Bianca give up Falliero. She is about to submit to him as a loving daughter when Capellio and the others point out to him how cruelly he is behaving. Contareno concedes defeat, and, to the joy of all-present, consents to the marriage of Bianca and Falliero. Venezia. Le procuratie di Piazza San Marco [“Procuratie” is the name for the lodgings of the “Procuratore” of Venice – they are not the arcades of Piazza San Marco. They might have been under the arcades, but they are NOT the same thing]. I nobili veneziani e le loro dame passeggiano nella piazza, rallegrandosi perché è stata sventata una congiura degli Spagnoli contro Venezia. Contareno e Capellio, senatori veneziani appartenenti a due famiglie impegnate in un’annosa disputa su un lascito, si incontrano per tentare una riconciliazione. Il ricco Capellio è innamorato di Bianca, figlia di Contareno, ed è disposto a rinunciare alle proprie rivendicazioni in cambio della sua mano. Capellio accetta subito, perché in questo modo spera di restituire alla sua famiglia la ricchezza e lo splendore di un tempo. Un colpo di cannone annuncia l’arrivo del Doge e del suo seguito. Il Doge annuncia a Contareno che la sua opinione è prevalsa: il Senato ha approvato una legge che punisce con la morte chiunque si renda colpevole di associazione con le ambascerie straniere. Capellio dichiara che, se fosse stato presente all’assemblea del Senato, non avrebbe votato per una legge così drastica, dal momento che non c’è più pericolo di una congiura straniera. Il Doge risponde che Venezia non è completamente sicura dalle minacce della Spagna; addirittura, si dice che il nobile Falliero sia stato ucciso in battaglia. Arriva un ufficiale per informare il Doge che la battaglia è stata invece vinta da Falliero, che sta sbarcando sulla spiaggia vicina. Falliero entra con i suoi ufficiali, salutato con entusiasmo dalla folla, e annuncia che l’esercito spagnolo è stato sconfitto. Il Doge lo elogia e l’invita a partecipare con lui a una cerimonia di ringraziamento nella basilica. Il cortile della casa di Contareno. Bianca e le sue ancelle si rallegrano del ritorno di Falliero, di cui Bianca è innamorata. Costanza, la nutrice, le dice che l’uomo intende chiedere la sua mano, ma Bianca teme un possibile rifiuto del padre; Falliero non è ricco. Costanza esce e arriva Contareno, che comunica alla figlia di avere scelto per lei un magnifico marito. La fanciulla spera che si tratti di Falliero, ed è costernata nell’apprendere che si tratta invece di Capellio. Contareno l’ammonisce: se continua a pronunciare quel nome perderà l’amore del padre, che farà in modo di vendicarsi di Falliero. Inoltre, Contareno dichiara che morirebbe di dolore se la figlia gli disobbedisse. Bianca si rassegna ad accettare il suo volere. Una stanza in casa di Contareno. Falliero dice a Costanza che adesso pensa di potere fare visita apertamente a Bianca; suo padre non dovrebbe più considerarlo inferiore. Dopo aver assicurato a Falliero che Bianca non vede l’ora di rivederlo, Costanza la vede avvicinarsi e lascia soli i due innamorati. Addolorata, Bianca rivela a Falliero che suo padre non intende acconsentire alle loro nozze e le ha proibito addirittura di pensare a lui, poi si allontana precipitosamente, mentre Costanza rientra in gran fretta: Falliero è in pericolo. Costanza esce, trascinando con sé Falliero, prima dell’ingresso di alcuni parenti di Contareno e Capellio con amici e servitori. Infine, arrivano Contareno e Capellio e, dopo, Bianca, evidentemente afflitta, cosa che Capellio non manca di notare. Quando Contareno ordina alla figlia di firmare il contratto nuziale, Bianca esclama che non può, ma suo padre insiste, inflessibile. La fanciulla è sul punto di firmare quando irrompe Falliero e l’accusa di essergli infedele. Inizia una lite tra Capellio e Falliero; Capellio insiste che Bianca è ormai sua sposa. Contareno ordina ai suoi servitori di scacciare Falliero da casa sua e Falliero, provocatoriamente, ammonisce Contareno e Capellio che la sua ira ha ormai raggiunto il culmine. Un cortile interno in casa di Contareno; un muro, in fondo, lo separa dalla residenza dell’ambasciatore spagnolo. È notte. Costanza conduce nel cortile Bianca, spaventata e tremante, e la convince a incontrare Falliero per un ultimo addio. Bianca acconsente, ma è riluttante; teme per la vita di Falliero. Costanza esce e poco dopo entra, agitato, Falliero, che supplica Bianca di fuggire con lui. La fanciulla risponde che, nonostante il suo profondo amore per lui, il suo onore non le consente di disobbedire al padre. Tuttavia, quando Falliero dichiara che la sua vita dipende dalla risposta della donna, si affretta ad accettare. Mentre stanno per uscire, entra Costanza per avvisarli che si avvicina Contareno. Falliero non ha scelta: deve arrampicarsi sul muro e fuggire passando dalla residenza dell’ambasciatore spagnolo, anche se corre il rischio di essere condannato a morte. Scavalca il muro poco prima dell’arrivo di Contareno, seguito da Capellio. Contareno assicura Capellio dell’amore di Bianca, ma l’aperta infelicità della donna fa insospettire Capellio, che sta per andarsene, irato, mentre Contareno minaccia di diseredare Bianca, quando Pisani, Cancelliere dei Tre, arriva con la notizia che Falliero è stato sorpreso nella residenza dell’ambasciatore spagnolo e sta per essere processato dal Consiglio dei Tre. Contareno pregusta, soddisfatto, la propria vendetta contro Falliero. La sala del Consiglio dei Tre, con pareti coperte di drappeggi neri. Entra Falliero, condotto dalle guardie e chiede chi sarà a giudicarlo. Gli viene risposto che si tratta di Loredano, Capellio e Contareno. Falliero teme di essere perduto, ma Pisani lo rassicura: sebbene Contareno possa essere duro e inflessibile, Capellio è un uomo giusto e sicuramente potrà influenzare Contareno, che adesso è suo suocero. Nell’udire ciò, Falliero perde ogni speranza. Quando viene condotto davanti ai giudici, rifiuta di difendersi e accetta di firmare una confessione di colpevolezza. Ma prima che possa farlo, un attendente annuncia che un complice del colpevole chiede udienza. Entra Bianca, sotto un fitto velo. Quando viene rivelata la sua identità, Contareno tenta di farla allontanare, ma Capellio insiste perché sia ascoltata. Bianca spiega come mai Falliero è finito nella residenza dell’ambasciatore spagnolo e Falliero, ormai sicuro del suo amore, dichiara la propria innocenza. Contareno desidera ancora trovarlo colpevole e firma la condanna a morte. Loredano fa altrettanto, ma Capellio si rifiuta ed esclama che Falliero dovrà essere giudicato dal Senato. Una stanza in casa di Contareno. Capellio conduce a casa Bianca e, dopo aver detto a Costanza che deve correre al Senato per difendere Falliero, si precipita fuori. Bianca rimane in ansia finché non sopraggiungono Falliero, Capellio e i nobili. Il Senato ha dichiarato Falliero innocente. Arriva Contareno e cerca di convincere Bianca a rinunciare a Falliero. Per rispetto filiale, la fanciulla sta per obbedirgli, quando Capellio e gli altri gli fanno notare la crudeltà del suo comportamento. Contareno ammette la propria sconfitta e, tra la gioia di tutti i presenti, acconsente alle nozze di Bianca e Falliero. Der Markusplatz, Venedig. Die als Procurazien bekannten Arkaden sind voller Menschen. Venezianische Adelige schlendern über den Platz und feiern die Aufdeckung einer spanischen Verschwörung gegen Venedig. Contareno und Capellio, zwei venezianische Senatoren, deren Familien seit vielen Jahren wegen einer Erbschaft im Streit liegen, begegnen sich und hoffen auf eine Versöhnung. Der wohlhabende Capellio erklärt, dass er Contarenos Tochter Bianca liebt und im Gegenzug für die Erlaubnis, sie zu heiraten, jeden Anspruch auf die Erbschaft aufzugeben bereit ist. Capellio willigt sofort ein, sieht er dies doch als Möglichkeit, seiner Familie wieder zu ihrem früheren Wohlstand und Glanz zu verhelfen. Das Donnern einer Kanone kündet die Ankunft des Dogen und seines Hofstaats an. Der Doge berichtet Contareno, dass seine Meinung sich durchgesetzt und der Senat ein Gesetz erlassen hat, nach dem jeder, der des Verkehrs mit ausländischen Gesandten für schuldig befunden wird, zum Tode verurteilt wird. Capellio erklärt, hätte er an der Senatssitzung teilgenommen, hätte er einem derart strengen Gesetz nie zugestimmt, da keine Gefahr einer ausländischen Verschwörung mehr bestehe. Der Doge widerspricht: Die Gefahr für Venedig sei noch nicht gebannt, die spanische Bedrohung bestünde nach wie vor, es ginge sogar das Gerücht um, dass der edle Falliero in der Schlacht gefallen sei. Da tritt ein Beamter auf und teil dem Dogen mit, dass Falliero die Schlacht gewonnen hat und in diesem Moment ganz in der Nähe des Markusplatzes an Land geht. Wenig später kommt Falliero mit seinen Offizieren auf den Platz und wird von der Menge mit Jubelrufen empfangen. Er verkündet, dass die spanische Armee besiegt ist; der Doge preist ihn und lädt ihn zur Teilnahme an der Dankesmesse im Dom ein. Der Vorplatz von Contarenos Haus. Bianca und ihr Gefolge freuen sich über die Heimkehr Fallieros, dem Biancas Liebe gilt. Ihre Amme Costanza sagt ihr, dass Falliero um ihre Hand anhalten will, doch Bianca fürchtet, dass ihr Vater ihn abweisen wird, da er nicht wohlhabend sei. Kaum ist Costanza abgetreten, erscheint Contareno und sagt seiner Tochter, dass er einen wunderbaren Ehemann für sie gefunden habe. Sie hofft, dass er damit Falliero meint, und entsprechend groß ist ihr Kummer, als sie erfährt, dass ihr Vater Capellio für sie ausersehen hat. Contareno warnt sie – wenn sie jemals wieder Fallieros Namen erwähne, werde er ihr seine Liebe entziehen und sicherstellen, dass auch Falliero dafür büßen müsse. Darüber hinaus erklärt er, er würde vor Kummer sterben, wenn sie ihm nicht gehorche. Unglücklich beugt Bianca sich seinem Willen. Ein Raum in Contarenos Haus. Falliero erzählt Costanza, dass er glaubt, Bianca nicht mehr heimlich besuchen zu müssen, da ihr Vater in ihm keinen Geringen mehr sehen könne. Costanza vesichert, dass Bianca das Wiedersehen mit ihm herbeisehne. Da tritt Bianca auf, und Costanza lässt das junge Paar allein. Niedergeschlagen berichtet Bianca ihrem Geliebten, dass ihr Vater nicht in ihre Hochzeit einwilligt und ihr sogar verboten hat, an Falliero zu denken. Dann läuft sie davon. Eilig kehrt Costanza zurück und warnt Falliero, er setze sich großer Gefahr aus, wenn er nicht sofort verschwinde, und zieht Falliero mit sich fort. Schon erscheinen Verwandte Contarenos und Capellios zusammen mit Freunden und Bediensteten. Schließlich treten auch Contareno und Capellio auf, gefolgt von Biana; ihre offensichtliche Trauer entgeht Capellio nicht. Als Contareno ihr befiehlt, den Heiratsvertrag zu unterzeichnen, ruft Bianca, das könne sie nicht, doch auf Beharren ihres strengen Vaters hin will sie gerade unterschreiben, als Falliero in den Raum stürzt und ihr vorwirft, ihn zu hintergehen. Capellio und Falliero streiten, denn Capellio besteht darauf, dass Bianca nun ihm gehöre. Contareno lässt Falliero von seinen Bediensteten aus dem Haus werfen, doch zuvor warnt dieser Contareno und Capellio, dass sein Zorn jetzt keine Grenzen mehr kenne. Ein Hof in Contarenos Haus, dessen Außenmauer an die Residenz des spanischen Gesandten grenzt. Es ist Nacht. Costanza führt die vor Angst zitternde Bianca in den Hof und beschwört sie, Falliero zum Abschied ein letztes Mal zu empfangen. Nur widerstrebend willigt Biana ein, fürchtet sie doch um Fallieros Leben, wenn er im Haus angetroffen wird. Costanza tritt ab, und wenig später erscheint Falliero. Erregt beschwört er Bianca, mit ihm zu fliehen, doch sie erklärt, so sehr sie ihn auch liebe, ihre Ehre gebiete, dass sie ihrem Vater gehorche. Aber als Falliero erklärt, sein Leben hänge von ihrer Antwort ab, willigt sie ein, mit ihm zu fliehen. Gerade, als sie aufbrechen wollen, kehrt Costanza zurück und meldet, dass Contareno im Anzug sei. Fallieros einzige Fluchtmöglichkeit besteht darin, über die Mauer in die Residenz des spanischen Gesandten zu klettern – auch wenn er weiß, dass er mit dem Tode bestraft wird, sollte man ihn dort entdecken. Gerade noch rechtzeitig, bevor Contareno auftritt, gefolgt von Capellio, überwindet er die Mauer. Contareno versichert Capellio, dass Bianca ihn liebt, doch dieser wird misstrauisch angesichts Biancas offensichtlicher Trauer. Zornig will er das Haus verlassen, während Contareno droht, er werde Bianca verstoßen, da erscheint Pisani, der Kanzler des Dreierrats, und verkündet, dass Falliero soeben in der Residenz des spanischen Gesandten festgenommen wurde und ihm vom Rat der Drei der Prozess gemacht werden wird. Frohlockend erkennt Contareno seine Chance, an Falliero Rache zu üben. Der schwarz ausgekleidete Versammlungsraum des Dreierrats. Falliero wird von Wachen hereingeführt. Auf seine Frage, wer das Urteil über ihn fällen wird, erfährt er die Namen Loredano, Capellio und Contareno. Er sieht alle Hoffnungen schwinden, doch Pisani sagt ihm, dass Contareno zwar streng und sturköpfig sei, Capellio aber ein gerechter Mensch und jetzt, da er mit Bianca verheiratet sei, sicher seinen Einfluss auf Contareno geltend machen werde. Bei dieser Antwort verliert Falliero alle Hoffnung; er weigert sich, sich vor den Richtern zu verteidigen, und will sein Schuldbekenntnis unterzeichnen. Doch bevor es dazu kommt, kündet ein Gerichtsdiener den Auftritt eines Komplizen des Angeklagten an. Bianca erscheint, tief verschleiert. Als sie ihre Identität preisgibt, will Contareno sie aus dem Saal entfernen lassen, doch Capellio besteht darauf, sie anzuhören. Bianca erklärt, wie es dazu kam, dass Falliero in der Residenz des spanischen Gesandten aufgefunden wurde, und Falliero, nunmehr von Biancas Liebe überzeugt, erklärt seine Unschuld. Contareno will ihn dennoch verurteilen und unterzeichnet sein Todesurteil, wie auch Loredano. Doch Capellio schiebt das Dokument von sich und erklärt, über Fallieros Schicksal müsse der Senat befinden. Ein Raum in Contarenos Haus. Capellio bringt Bianca nach Hause. Er erzählt Costanza, dass er zum Senat eilen muss, um sich für Falliero einzusetzen, und eilt davon. Ängstlich bleibt Bianca zurück, bis Falliero in Begleitung von Capellio und den venezianischen Adeligen erscheint und ihr sagt, dass der Senat ihn für unschuldig erklärt hat. Da tritt Contareno ein und will Bianca überreden, Falliero aufzugeben. Als liebende Tochter will sie sich seinem Wunsch fügen, doch Capellio und die anderen führen ihm seine Grausamkeit vor Augen. Da gibt Contareno sich geschlagen und willigt zur Freude aller Anwesenden in die Hochzeit Biancas mit Falliero ein. La place Saint-Marc à Venise. La foule se presse sous les arcades – les fameuses procuratie. Les nobles vénitiens qui se promènent sur la place en compagnie de leur épouse se réjouissent à la nouvelle qu’une attaque espagnole contre Venise vient d’être repoussée. Contareno and Capellio, deux sénateurs vénitiens dont les familles respectives s’affrontent depuis plusieurs années pour une question d’héritage se rencontrent en vue d’une réconciliation. Le riche Capellio déclare qu’il est épris de la fille de Contareno, Bianca, et qu’il renoncera à l’héritage à condition d’épouser la jeune fille. Capellio accepte cette offre sur le champ, car il y voit le moyen de rendre à sa famille sa richesse et sa gloire d’antan. Un coup de canon annonce l’arrivée du doge, entouré de ses courtisans, qui apprend à Contareno qu’à son instigation le Sénat a voté une loi punissant de mort quiconque est déclaré coupable de s’être associé avec des représentants de l’étranger. Capellio lui répond que si lui-même avait été présent au Sénat lors du débat, il aurait voté contre cette loi, la jugeant trop sévère maintenant que la menace étrangère ne pèse plus sur Venise. Le doge lui réplique que Venise n’est pas tout à fait complètement à l’abri : la menace de l’Espagne n’a pas entièrement disparu et l’on dit que le noble Falliero a été tué pendant les combats. Un héraut arrive alors pour annoncer au doge que Falliero a, en fait, gagné la bataille et qu’il est en train de débarquer sur un proche rivage. Falliero fait son entrée accompagné de ses officiers et la foule l’accueille avec enthousiasme. Il annonce la défaite de l’armée espagnole au doge, qui l’invite à se joindre à lui pour rendre grâce à Dieu dans la cathédrale. Devant la maison de Contareno. Bianca et ses servantes se réjouissent du retour de Falliero, dont Bianca est éprise. Sa nurse, Costanza, lui apprend que Falliero a l’intention de la demander en mariage, mais Falliero n’étant pas riche, Bianca craint un refus de la part de son père. Après le départ de Costanza, Contareno vient annoncer à sa fille qu’il lui a choisi un époux admirable. Elle espère qu’il s’agit de Falliero et n’en est que plus que désespérée quand elle apprend que c’est Capellio. Contareno la prévient que s’il l’entend prononcer à nouveau le nom de Falliero, il la reniera et se vengera de son bien-aimé. Comme il ajoute qu’il mourra de chagrin si Bianca lui désobéit, celle-ci se soumet, le cœur lourd, à la volonté de son père. La maison de Contareno. Falliero explique à Costanza qu’il pense désormais pouvoir présenter ouvertement ses hommages à Bianca sans être considéré par son père comme un inférieur. Costanza assure à Falliero que Bianca est impatiente de le rencontrer et, voyant celle-ci approcher, laisse les amants seuls. La pauvre Bianca explique à Falliero que son père s’oppose à leur mariage et qu’il lui a même interdit de penser à lui, puis quitte la pièce précipitamment. Costanza revient alors pour vite prévenir Falliero qu’il est en danger s’il reste. Costanza sort en entraînant Falliero avec elle, tandis que les parents et amis de Contareno et de Capellio font leur entrée accompagnés de leurs serviteurs. Enfin, Contareno et Capellio arrivent suivis de Bianca, dont la tristesse manifeste n’échappe pas à Capellio. Lorsque Contareno lui enjoint de signer le contrat de mariage, Bianca dit d’abord qu’elle ne saurait le faire ; devant la furieuse insistance de son père, elle est sur le point de céder lorsque Falliero fait irruption dans la pièce et l’accuse d’infidélité. Une dispute s’ensuit entre Falliero et Capellio, qui prétend que Bianca est désormais à lui. Contareno ordonne à ses domestiques de jeter Falliero dehors, et celui-ci prévient Contareno et Capellio que rien ne l’arrêtera. La cour intérieure de la maison de Contareno, séparée de la résidence de l’ambassadeur d’Espagne par un mur. Il fait nuit. Costanza précède Bianca, toute tremblante, dans la cour, et la persuade de rencontrer Falliero pour un dernier adieu. Bianca accepte à regret, car elle craint pour la vie de Falliero s’il est découvert dans la maison. Costanza sort. Peu après Falliero fait son entrée. Il est très agité. Il supplie Bianca de s’enfuir avec lui mais elle lui répond que malgré l’amour qu’elle lui porte, son honneur lui interdit de désobéir à son père. Falliero dit ne pas pouvoir vivre sans elle, aussi accepte-t-elle sans tarder de s’enfuir avec lui. Ils s’apprêtent à partir ensemble lorsque Costanza revient les prévenir de l’arrivée imminente de Contareno. Falliero n’a pas d’autre issue que de sauter le mur qui les sépare de la résidence de l’ambassadeur d’Espagne, ce qu’il fait en sachant bien qu’il risque la peine de mort si on le découvre chez l’étranger. A peine a-t-il disparu que Contareno arrive suivi de Capellio. Contareno assure Capellio que Bianca l’aime mais, devant l’évidente tristesse de Bianca , Capellio exprime son doute. Dans sa colère, il prend congé de Contareno tandis que celui-ci menace de renier Bianca. Au même moment arrive Pisani, chancelier du Conseil des Trois, pour leur annoncer que Falliero a été capturé à l’intérieur de la résidence de l’ambassadeur d’Espagne, et qu’il doit comparaître devant le Conseil des Trois. Contareno se réjouit à l’idée de se venger de Falliero. La salle drapée de noir où se réunit le Conseil des Trois. Falliero, qui a été amené sous escorte, demande qui seront ses juges. Loredano, Capellio et Contareno lui est-il répondu. Il dit craindre que sa cause ne soit désespérée, mais Pisani lui répond que, si Contareno est dur et inflexible, Capellio est juste ; il tentera sans doute, dit-il, d’user de son influence sur Contareno dont il s’apprête à épouser la fille. A ces nouvelles, Falliero perd tout espoir. Lorsqu’il est amené devant ses juges, il refuse de se défendre et accepte de signer une déclaration de culpabilité. Il est sur le point de le faire lorsqu’un huissier annonce qu’une complice de l’accusé vient demander audience. La silhouette voilée de Bianca s’avance. Lorsqu’elle révèle son identité, Contareno essaie de la faire sortir, mais Capellio insiste pour qu’on l’entende. Bianca explique les circonstances qui ont amené Falliero à se trouver dans la résidence de l’ambassadeur d’Espagne, et Falliero, désormais convaincu de l’amour de Bianca, déclare son innocence. Contareno, qui souhaite toujours le voir condamné, signe son arrêt de mort, Loredano aussi. Capellio refuse, par contre, en disant que Falliero devra être jugé par le Sénat. La maison de Contareno. Capellio, qui a raccompagné Bianca, dit à Costanza qu’il va de ce pas au Sénat pour intervenir en faveur de Falliero. Bianca attend anxieusement les nouvelles, jusqu’à ce que Falliero lui-même se présente devant elle accompagné de Capellio et des nobles vénitiens. Falliero lui explique que le Sénat l’a déclaré innocent. Contareno arrive alors pour essayer de convaincre Bianca de renoncer à Falliero. Elle est sur le point d’accéder à ses prières par devoir filial quand Capellio et les autres se mettent à reprocher à Contareno sa cruauté. Contareno cède et, à la joie de tous, consent au mariage de Bianca et de Falliero.